It’s very grey, this River Café. The wallpaper matches the river, surging outside the front door. Of course, this place has nothing to do with the real River Café, the exciting, bustling Italian foodie joint in West London that created Jamie Oliver and Hugh Fearnley-Whittingstall. This is David Kennedy’s River Café, an altogether more modest affair above a pub called the Quay Taphouse on North Shields Fish Quay. The restaurant consists of three or four small Victorian rooms knocked together, with windows looking out over the river. To offset the relentless grey, somebody thought framed prints of Paris street cafés and big flowers would be a good idea. It was a very bad idea. Just because Paris has cafés, doesn’t make it relevant. The River Tyne should be the star here, together with the food that’s brought each dawn by the boats moored alongside. There must be plenty of North East artists who would love to complement the grey with images of our romantic river. When we arrived, it was just after high tide – a good time, in past times, for throwing dead bodies into the filthy flood, or for watching giant liners being towed out to sea. Within minutes we were transfixed as a huge red tanker was slowly dragged by yellow tugs past our window. For anyone who loves ships and the sea, this restaurant must have one of the best views in Britain. In earlier centuries, by night the North Shields fish quay was a dark, dangerous place, with murky goings-on behind forbidding warehouses. Now the river is cleaner, and the warehouses have been replaced by modern apartments for the newly gentrified. 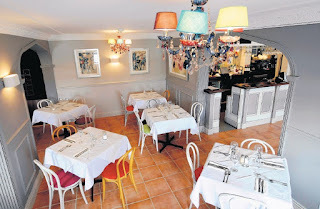 It has a vibrant social scene with several restaurants, most of which are Italian (almost all, curiously, called Sambuca, which must make booking a very confusing process). I noticed that some offered a three-course lunch for £3.95. The River Café matches this with an amazing value happy hour menu. Sadly we arrived after 6.30pm, so our à la carte meal for 3 with a modest bottle of wine cost us around £100. Mr Kennedy is a good chef, one of the best in the North East. I recently wrote a glowing review for his new place at Vallum Farm. He was definitely in the kitchen that day. 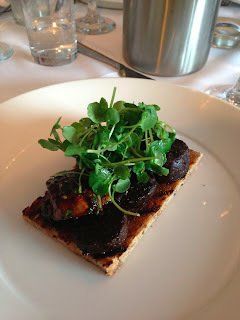 But he doesn’t actually cook at The River Café – this is done by a giant of a man called John Wiegmann, who makes a very good chicken liver starter. Exceptional, in fact: spicily devilled with the smoothest Spanish black pudding and piled on a thin slice of granary bread. The dish might have worked better on brioche, but there was no doubting the skill – the livers were soft as butter and perfectly pink. It was a sumptuous triumph of a starter. 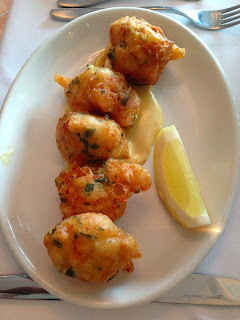 Mrs Diner’s friend ordered salt cod – crispy batter balls of deliciously fresh fish, with restrained saltiness, served with saffron aioli. 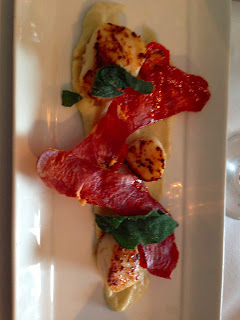 I had queen scallops, cauliflower puree and crisp Serrano ham, a dish I must have ordered dozens of times in different restaurants. It was no better than most, but the scallops were well cooked. 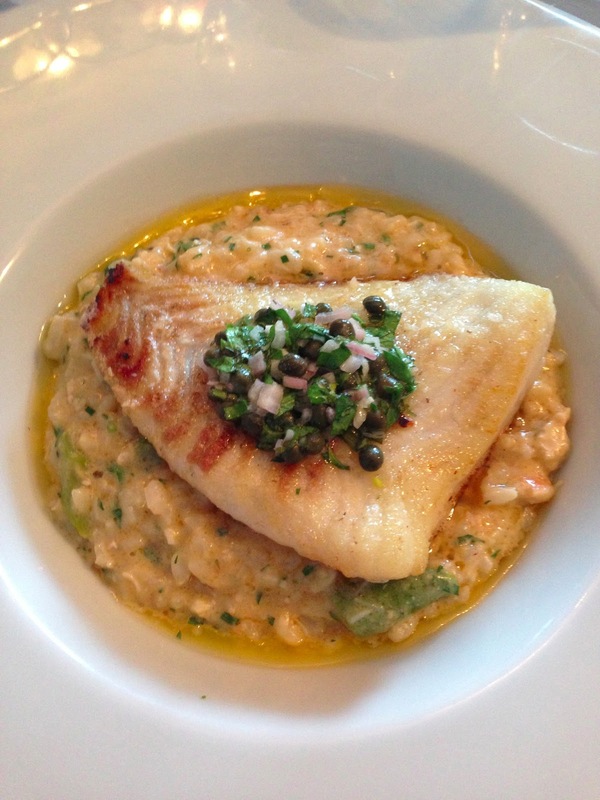 If the salt had been held back on the cod, it arrived with fanfares on our main courses. Mrs Diner and her friend both had lemon sole, a timid, inoffensive fish that must be handled with care. Sadly, any taste these fishes retained on their short journey from the quayside was smothered by over-seasoning and a thick layer of capers, red onion and parsley. Meanwhile I had that king of fish, turbot, served on crab and asparagus risotto. It too had been slightly over-salted and was crowned with a spoonful of the same caper mix. But the turbot is a stronger fish, and can rise above such indignities. With less seasoning, this could have been a very good plate, but the crab risotto was overcooked, its starches had long since converted the rice to porridge. It did have nice crunchy pieces of asparagus. For dessert, Mrs Diner hated her rhubarb and apple oat crumble: it was too tart, but she loved the pistachio ice cream. In fact, all the ice creams were good – including the vanilla on my sticky toffee pudding. Well, I just had to try that, didn’t I? It’s Mr Kennedy’s signature pud. We have also tried the restaurant and the food was heavily over salted, must be fixed asap! Tried this place a couple of months ago for lunch. The menu was disjointed and the food unimpressive. There's better on offer on the quayside.